The medical term for a swallowing problem is Dysphagia and this recent case from our clinic illustrates how effective Medical Massage can be in treating of this condition. An 85 year-old male has been our patient for years. He is a dedicated golfer and while getting older he continues to enjoy a game which demands a lot of strength and practice. During these years we helped him with various abnormalities including cervical pain, right shoulder pain, lower back pain, headache and hip pain while keeping him playing. Recently he came to our clinic with mild lower back tension which he developed after playing golf three days in the row. Two sessions put everything together and just before leaving the clinic the patient casually mentioned that he was going to a respected local hospital. Knowing him for several years I just asked him what happened, and if everything was OK since he is at an advanced age. The patient said that he was going to the hospital to attend a class which is supposed to help with his swallowing. His answer triggered my professional curiosity and I asked him for details. According to the patient, approximately three month ago, he noticed he had difficulty swallowing larger and firmer pieces of food. Initially he didn’t pay significant attention to it and kept chewing food longer. However, the situation started to be more complicated when he noticed that he developed difficulties in swallowing large pills. Several times the pill stuck in his throat for a couple hours. Eventually he was able to swallow it and push it into his esophagus, but only after the pill was softened by saliva. Besides having distress in his throat, he also felt a very unpleasant bitter taste in his mouth all time while the pill got softer and started to dissolve in his pharynx, instead of doing that in his stomach. He stopped taking his food supplements since they were large pills, but one medication was prescription which he had to take daily. This situation started to worry him, so he visited an ENT doctor in the hospital. After detailed examination the physician confirmed that he indeed had narrowing of the pharynx, but there was no tumor or polyp which could be blamed for the dysphagia. According to the ENT doctor stress was more likely the cause of the spasm in the pharynx and the patient was prescribed muscle relaxants and anti-anxiety medication. Indeed, the patient was under stress due to a family situation. Since after two weeks the patient didn’t feel any improvement the only solution which was offered to him was a special class where a PT would teach him how to position his head and neck to prevent dysphagia while he takes medications. I offered the patient a quick examination of his throat and anterior neck. Since we helped him decisively in all previous cases of his somatic pains he immediately agreed. I asked the patient to lay on his back, tilt his head slightly backward and swallow several times. By putting his head backward additionally stressed his suprahyoid and infrahyoid muscles and by doing that I would be able to better observe their coordination during swallowing. First, I observed swallowing from the side; next I palpated his suprahyoid and infrahyoid muscles and finally asked him to swallow while gently holding his hyoid bone and examining its vertical mobility during each swallowing. Fig. 1 illustrates the area of examination. 1. It took several seconds for the patient to start to swallow. He couldn’t do it immediately on command. 2. Suprahyoid muscles were very sensitive during palpation. Discomfort increased significantly if even mild pressure was applied on suprahyoid muscles while the patient swallowed. 3. While gently holding the hyoid bone by both ends using the tips of my index and the thumb, I asked the patient to swallow. As I mentioned above it took him time to initiate swallowing, but additionally it was obvious that his hyoid bone exhibited a very small vertical shift while he swallowed. However, all our patients had dysphagia due to something: tension, anterior scalene muscle, neck surgery, etc. It was the first patient where dysphagia developed by itself without any somatic or neurological initial trigger. Despite that, there was a very good chance that we could help him again and we scheduled an appointment the next day. The video below illustrates the swallowing recorded before the first session. Please notice how long it takes for the patient to initiate the act of swallowing. Also pay attention to the complete disbalance in contraction of suprahyoid muscles while he tries to swallow. The time he used for the preparation to the swallowing his motor cortex spent on trying to restore some coordination in the suprahyoid muscles’ contractions. 1. B-manual effleurage along the drainage from lower edge of the lower jaw to both supraclavicular fossa. 11. Application of pressure (within comfort) with flatly placed 2nd-3rd fingers of both hands positioned across the suprahyoid area while asking the patient to swallow repeatably. 12. While index and thumb gently controlled both ends of the hyoid bone I asked the patient to swallow and carefully resisted the hyoid bone’s upper shift during each swallowing. Here is a video recorded after the second session. Notice that the patient was able to swallow more quickly. 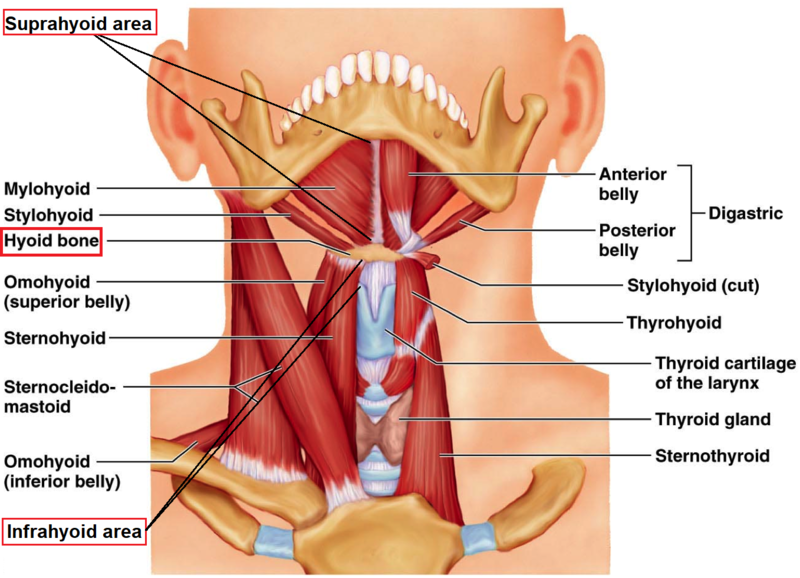 The readers may also notice smoother contractions of suprahyoid area muscles. It now normally ‘bulges’ forward compared to the first video and it indicates increased flexibility of the suprahyoid muscles. 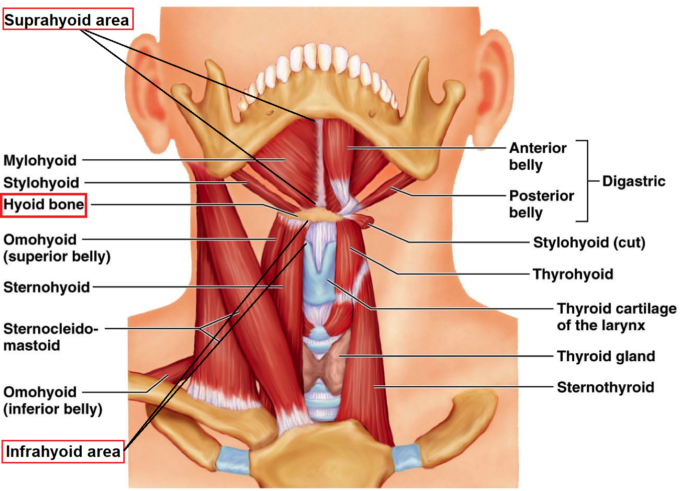 Unfortunately, it was impossible to illustrate in video format the difference in the vertical shift of hyoid bone during the swallowing before and after the treatment. However, the palpation after the first session indicated significant increase in the mobility of the hyoid bone during each swallowing. It took us three sessions of Medical Massage therapy to completely restore swallowing and eliminate dysphagia. 1. Emotional stress may act as the initial trigger to dysphagia. Usually it fades away by itself if stress conditions normalize. In the case of our patient the initial stress triggered dysphagia, but developed disbalance in the action of suprahyoid and infrahyoid muscles stayed and got progressively worse. 2. The act of swallowing is a very complex event which requires perfect coordination between several key players. Even mild discoordination will compromise swallowing. 3. His age and absence of positive dynamic in his dysphagia, which the patient noticed, was a real concern since its further progress may greatly affect the quality of his life. 4. There are very limited treatment options doctors may offer to these patients and unfortunately manual restoration of the soft tissue balance using Medical Massage is not in the therapy arsenal used by American physicians.